vegan cheese review | Save the Kales! 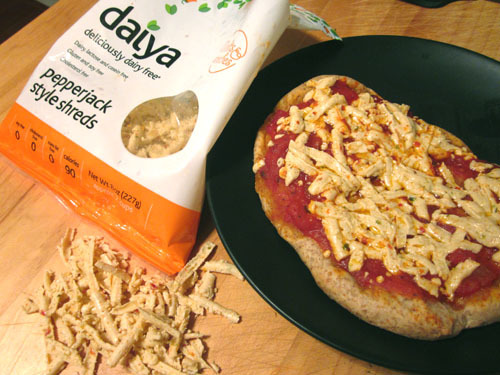 For vegan cheese veterans, count me among the masses that adore Daiya products. Ooey-gooey melty AND only 90 calories AND no animals harmed, everyone wins! For those of of you that never tried it but are curious, let me encourage you to try it. It’s so good. SO GOOD. Here’s the thing: I don’t buy it or use it very often. Mostly because a) it’s a little pricey; at $4.99 a bag it’s fine once in a while, but I don’t have the budget to smother everything with this stuff all the time, and b) I don’t want to rely on having to cover everything with cheese, albiet vegan, for something to taste good. That said, I get some once or twice a month as a treat, and I cannot express to you my utter joy when I found out they had…. (cue dramatic music) PEPPERJACK “CHEESE”. I can’t even believe I waited this long to get it, but it’s everything I hoped it would be and more. Last week I was lazy and just made some little pizzas for dinner. 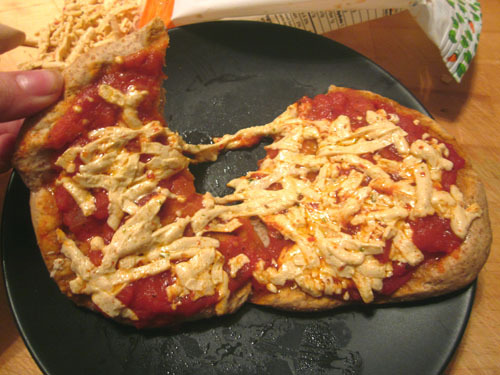 A basic whole wheat dough, jarred tomato sauce, and Daiya in the oven til crispy and melty. This may, in fact, change your life. You should be able to find Daiya at health food stores, and if you live in the Lehigh Valley I can confirm that Wegman’s stores also carry it (organic food refrigerated section). The only downside to this stuff is that you are going to crave it and want to put it on everything, and just want to eat pizzas all day, every day, forever. But don’t let that stop you from enjoying this! *If you’re new to Daiya products, I recommend (in order of most delicious, in my opinion): Pepperjack first, then Mozzarella, then Cheddar.